Is anyone else anxiously awaiting access to Pottermore? Is anyone already exploring the site? I was accepted for early access, but with barely over 2 weeks until it's open to everyone in October, I've just about lost hope of getting that sneak peek. At least the wait is almost over for all of us! Just because I needed a Harry Potter fix, it seemed like a good time to sample the Chocolate Frog I purchased during my trip to the Wizarding World of Harry Potter. In the books and movies, Chocolate Frogs are presented as lithe, enchanted chocolate creatures that could slip through your fingers with ease, or, if you're quick and lucky, wiggle all the way down to your stomach. Of course, there's no way to reproduce that experience for a mass market, but I was surprised by how the Chocolate Frog was brought to life for Universal Studios. There's no way the Chocolate Frogs sold at the actual Honeydukes inside the park could slip out a window. They're solid, huge, and surprisingly hefty! At an equally hefty theme park price price of $9.95 US, maybe Universal Studios was going for the value angle, but they didn't really hit that mark, either. The solid chocolate frog filled the entire box, but unfortunately it smelled a bit dusty, like a cheap Easter bunny. The easiest way to serve the frog seemed to be cutting into it with a knife, which was fun for my husband. Much to my dismay, the chocolate tasted like it smelled: dry, grainy, and a little chalky. The cocoa flavor was mild and very sweet, and even though it was a one-note chocolate flavor, I did appreciate that there were no sour or otherwise unpleasant aftertastes. The chocolate wasn't very milky, and although I dislike the overly sticky quality that milk chocolate often has, this frog could have used some creaminess. Now, I must disclose that I did wait a couple of months to eat this, but the package was sealed and far from the sell-by date, so it was a bit of a letdown. I'll admit that this blog has spoiled cheap chocolate for me, but for this price, I'd rather have less chocolate of a higher quality than this giant brick of disappointment. But, as Ron Weasley pointed out to Harry, It's the card you want, and in that respect, the Chocolate Frog was pretty cool. The package was gorgeous and well-constructed, and finding the holographic trading card inside really made me feel immersed in the Harry Potter universe. I got Rowena Ravenclaw (and I think I'd be a Ravenclaw), but I can't see myself trying to collect them all at $10 a frog. The packaging is absolutely an A+, but overall, this is a C. It's still a good souvenir because of the card and box, but the chocolate left a lot to be desired. 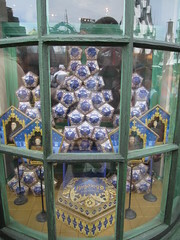 The Wizarding World of Harry Potter blog reviewed Chocolate Frogs and really liked them. Please remember, this is just my opinion. If you've got your heart set on a Chocolate Frog, I think the box and card alone will make you happy, and if you enjoy the chocolate, even better. That's too bad although not surprising. I will probably still buy one if given the chance just for the card and novelty of it. And I wasn't lucky enough to get early access. I'm anxiously awaiting the big open to the public in October. We will have to exchange usernames on the site! 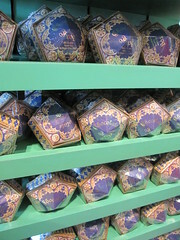 The Chocolate Frogs are definitely still worth it for the experience! We'll definitely have to exchange user names! 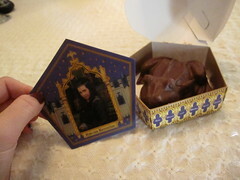 When I first went to wizarding world last February my friends & I bought the chocolate frogs. We were very surprised by how delicious & creamy they were (very different from those cheap, crunchy, little frogs that had been produced for years). 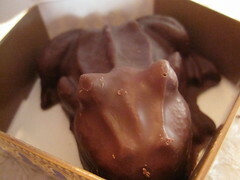 However, I just went back to Orlando again over this weekend & the chocolate frog I purchased this time is disgusting. I don't understand it. Perhaps they used a better chocolate when the park first opened but then reverted back to the cheaper recipe? Or maybe the chocolate expires prematurely? Whatever the reason, Universal really dropped the ball on this.